Spielbericht – Bochum Barflies e.V. 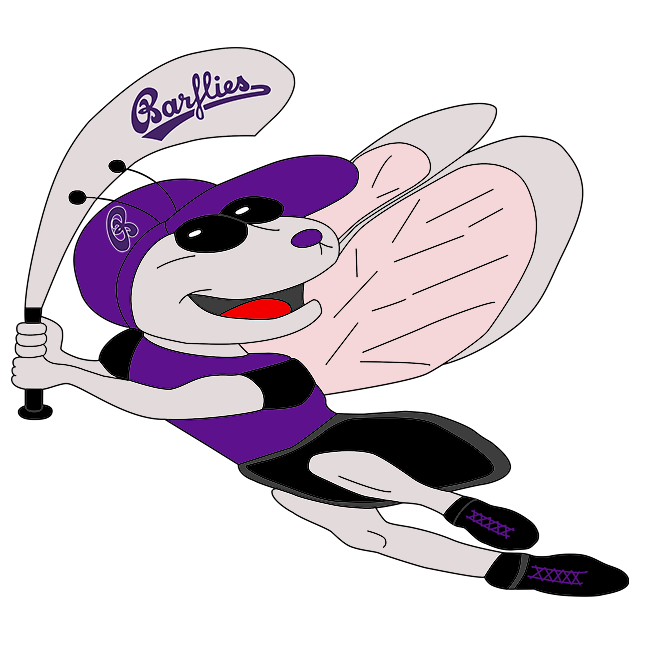 The Barflies‘ bats were strong against Ratingen on Sunday, but it wasn’t enough as the Barflies fell 17-7. Ratingen took an early lead in the first inning. Matthias Sacldemann grounded out, scoring one run. After the Barflies scored one run in the top of the seventh, Ratingen answered with one of their own. The Barflies scored when Esch induced Köster to hit into a fielder’s choice, with one run scoring. Ratingen then answered when J Trapp singled off of Warnath, driving in one run. Ratingen took the lead for good with three runs in the third inning. In the third Theis induced H Wolle to ground out, but one run scored, there were two errors, each allowing a run to score. Ratingen scored five runs in the sixth inning. Ratingen’s big inning was driven by a single by Benneckenstein, a single by Antweiler, and a single by Getts. Wolle earned the win for Ratingen. He tossed five and two-thirds innings, giving up six runs, nine hits, and striking out two. Theis took the loss for the Barflies. He threw five innings, giving up 11 runs, six hits, and striking out three. The Barflies had 13 hits in the game. Kaufmann, Theis, Froning, and Cho each collected multiple hits for the Barflies. Kaufmann led the Barflies with three hits in four at-bats. Köster led the Barflies with two stolen bases, as they ran wild on the base paths with seven stolen bases. Ratingen collected 13 hits. Antweiler, Getts, Ollesch, and Daghilghia each collected multiple hits for Ratingen. Antweiler went 3-for-4 at the plate to lead Ratingen in hits. Ratingen tore up the base paths, as three players stole at least two bases. Getts led the way with two. 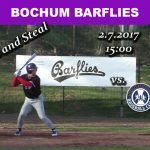 The Barflies fell behind early and couldn’t come back in a 20-12 loss to Hochdahl Neandertaler on Sunday. Hochdahl scored on a single by Daniel Faßbender in the first inning, a single by Sascha Sommer in the first inning, and a home run by Mark Sommer in the second inning. Despite the loss, the Barflies did collected 13 hits in the high-scoring affair. Unfortunately, Hochdahl Neandertaler had 21 hits on the way to victory. Hochdahl scored eight runs in the fifth inning. The big inning for Hochdahl came thanks to a single by T Fassbender, a double, a single by D Baptista, a single by Thomas Rockel, and a single by Peter Jetten. Fassbender earned the win for Hochdahl. He pitched nine innings, giving up 12 runs, 13 hits, and striking out five. Christian Theis took the loss for the Barflies. He tossed four and a third innings, allowing 14 runs, 12 hits, and striking out four. Julian Horn, Tobias Froning, Jonas Kaufmann, and Andreas Laudien each collected multiple hits for the Barflies. Laudien, Kaufmann, Froning, and Horn each collected two hits to lead the Barflies. Kaufmann led the Barflies with five stolen bases, as they ran wild on the base paths with 15 stolen bases. Sascha Sommer, Baptista, Jetten, Faßbender, Mark Sommer, Rockel, and Fassbender each collected multiple hits for Hochdahl. Hochdahl tore up the base paths, as three players stole at least two bases. Faßbender led the way with three. The Barflies and Lizards traded the lead back-and-forth on Sunday, but eventually, the Barflies prevailed 20-12. (Due to a scoring error in the 6th, the official score was recorded as 19-12.) The Barflies took the lead for good in the fifth inning. The game was tied at nine with the Barflies batting in the bottom of the fifth when there was an error, scoring one run. The Barflies were boosted by Ilia Sinev who went 5-for-6 at the plate with 3 RBI’s. Sinev singled in the second, third, fourth, and sixth, and doubled in the eighth. Herne Lizards captured the lead in the first inning. An error scored one run for Herne Lizards. The Barflies took the lead for good with two runs in the fifth inning. In the fifth Cho singled off of Ulrich, driving in one run. The Barflies scored six runs in the sixth inning. The Barflies‘ big inning was driven by an error, a single by Laudien, and a single. Christian Theis earned the win for the Barflies. He threw five innings, surrendering nine runs, six hits, and struck out three. Warnath recorded the last 12 outs to earn the save for the Barflies. Ulrich took the loss for Herne Lizards. He tossed two and two-thirds innings, surrendering eight runs, three hits, and striking out four. Müller started the game for Herne Lizards. He tossed two and two-thirds innings, giving up six runs, seven hits, striking out one, and walking one. The Barflies collected 18 hits. Sinev, Froning, Theis, Laudien, and Gerhardt each collected multiple hits for the Barflies. Sinev and Theis each drove in three runs to lead the Barflies. The Barflies tore up the base paths, as two players stole at least two bases. Sinev led the way with three. Herne had 11 hits in the game. Ulrich, Müller, and Jarocki each collected multiple hits for Herne Lizards. Ulrich went 3-for-5 at the plate to lead Herne Lizards in hits. Schlemminger led the Lizards with three stolen bases, as they ran wild on the base paths with 12 stolen bases. 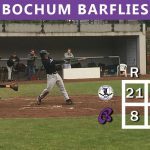 The Barflies watched the game slip away early and couldn’t recover in a 17-3 loss to Ratingen Goose-Necks 2 on Sunday. Ratingen took an early lead on a throwing error in the first inning. Ratingen scored three runs in the 4th, 5th, and 7th, one run in the 8th and six more in the 9th inning. Tobias Esch earned the win for Ratingen Goose-Necks 2. He pitched six innings, allowing two runs, four hits, and striking out six. Christian Theis took the loss for Barflies. He tossed four and two-thirds innings, surrendering seven runs, six hits, and striking out four. Barflies had five hits in the game. Peter Beargie and Andreas Laudien each collected multiple hits for Barflies. Ratingen collected 14 hits. „Powered by Narrative Science and GameChanger Media. Copyright 2017. All rights reserved.“ Any reuse or republication of this story must include the preceding attribution. Mit 9 Fly-outs, 8 Ground-outs, und nur 7 Hits, haben die Barflies nicht annähernd ihre durchschnittliche 16 Runs und 13 Hits pro Spiel erreicht. Die Yaks könnte konsistent ein paar Punkte pro Inning schaffen, dass es am Ende nach 8 Innings mit 3:13 stand. Gerade rechtzeitig hat Bochum nachgekocht und mit 9:7 gegen Hagen gewonnen. Nach 7 Innings musste das Spiel wegen Regen frühzeitig beendet werden.